I’m going to begin a little series of posts, though they won’t be consecutive, on commonly confused or mixed up drugs in a retail pharmacy. I’m not thinking primarily about drugs that simply sound alike or bottles that look alike. Those are a concern. But I’m thinking more along the lines of drugs for which there are often more than one form available and it is hard for a new technician or student to know which one to pick. 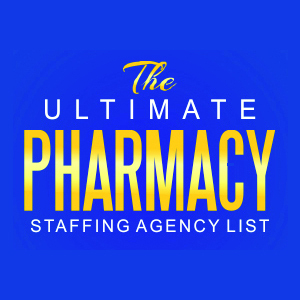 These drugs often sit side by side on the pharmacy shelf, and new pharmacy techs, students and even new retail pharmacists may not know how to pick the right one. I’m doing this in the hopes that a little more information might help prevent some errors. At the very least it might make someone’s job a little bit easier and less frustrating. If you find this sort of information helpful, shoot me an email and let me know. I’m open to suggestions for future posts. This one often confuses a new student or technician. These generics are the equivalent of the original brand name products Depakote and Depakote ER. Let’s start by discussing the brand names, and then talk about how to manage the generics. Depakote is an enteric coated divalproex sodium tablet that comes in 125mg, 250mg and 500mg strengths. It also comes in a capsule filled with enteric coated pellets that can be swallowed or opened and sprinkled on soft food. The tablets are approved for the treatment of seizures, bipolar disorder and migraine prevention. They are intended to be taken 2 to 3 times daily. This product was originally approved back in 1996. Depakote ER is an extended release version of divalproex sodium intended for dosing once daily and available in 250mg and 500mg tablets. Originally approved in 2000 for the treatment and prevention of migraines in adults, it is now approved for migraines, bipolar disorder and for seizures. It is the once daily dosing that is especially important when it comes to Depakote ER. Confusion sometimes arises because, as noted above, BOTH forms of Depakote come in a 250mg and 500mg tablet. These two formulations, however, are not the same and may not be interchanged. Generic Depakote is divalproex sodium DR (delayed release). The generic equivalent should have the words “delayed release” OR the words “enteric coated” on the label. Generic Depakote ER is divalproex sodium ER (extended release). The generic equivalent should have the words “extended release” or possibly “once daily” clearly written on the label. WAIT, WHAT ABOUT DEPAKENE (valproic acid)? Okay. Let me explain briefly. Depakene is the brand name for valproic acid. Both Depakote and Depakote ER contain divalproex sodium, which is converted to valproic acid in the body. Valproic acid is available generically as capsules or liquid. Depakote and Depakote ER are better tolerated than valproic acid, and therefore we don’t often see valproic acid used today. Divalproex DR (delayed-release) is the equivalent of Depakote. In this case “delayed-release” simply means that it is enteric coated, and thus the release of the medicine is “delayed” until it passes through the stomach. Usually dosed 2-3 times daily. Divalproex ER (extended-release) is the equivalent of Depakote ER. Usually dosed once daily. 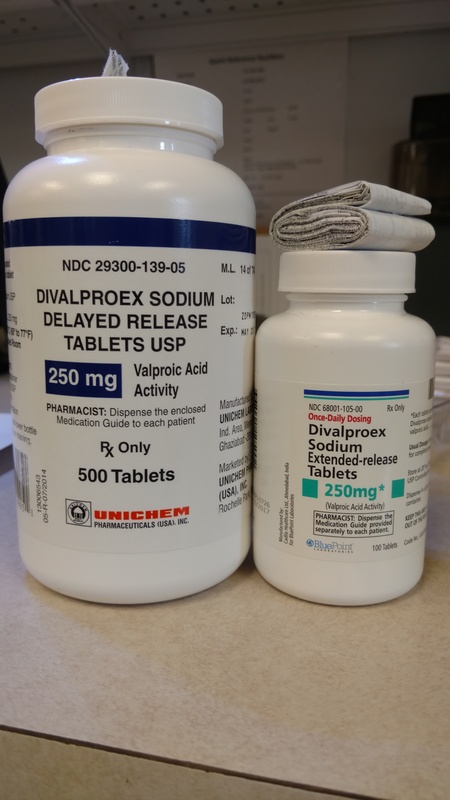 If the prescription just says “Depakote” or “divalproex” you want the divalproex DR (delayed-release) NOT the ER (extended-release). Note, dosing should generally be 2-3 times daily. 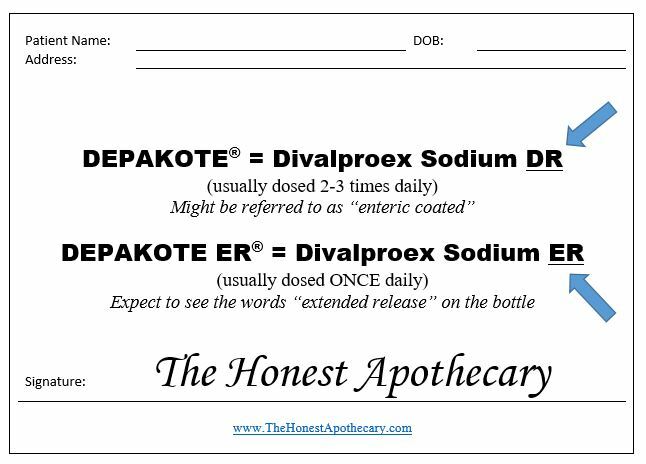 If the prescription says “Depakote ER” or “divalproex ER” you want the divalproex ER (extended-release) product. Note: it should almost always be dosed once daily. Neither Depakote (divalproex DR) nor Depakote ER (divalproex ER) should be chewed or crushed. For patients that cannot swallow pills or have had bariatric surgery, consider the Depakote Capsules (which can be opened and sprinkled on soft food) or conversion to valproic acid liquid.